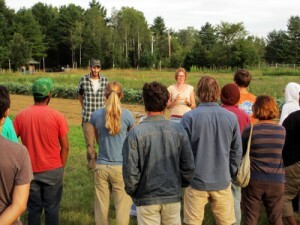 Last Wednesday, forty young farmers and young farmer enthusiasts met at the Maine Organic Farmers and Gardeners Association (MOFGA) fairgrounds in Unity, Maine for a farm tour and potluck. Founded in ‘71, MOFGA serves as a resource for agrarians by helping them grow and promote organic food, protect the environment, recycle natural resources, beef-up local food production, support rural communities, connect food buyers and eaters to healthy food and educate them about sustainable farm practices. For any farmer—young or old, new or experienced—MOFGA offers an encyclopedia of farming tips and resources and has earned a reputation for having statewide networking mojo. MOFGA’s arms reach wider still—offering seasoned, reputable apprenticeship and journeyman programs for young agrarians (check out their website). These mentoring programs connect young farmers, who have the desire to learn and practice organic farming techniques, with experienced farmers, who want to pass along their knowledge and expertise to the next generation of organic growers. Before farm tourists swapped beers, knobby tomatoes and multi-colored carrots at the MOFGA potluck, they had an opportunity to tour Proud Peasant Farm, overseen by MOFGA journeymen Holli Cederholm and Brian St. Laurent. Holli and Brian manage a home-scale, dairy goatherd and two acres (out of 250) of open-pollinated vegetables. The harvest is earmarked for a small CSA and two weekly farmers’ markets in Ellsworth and Acadia. Holli and Brian are tempeh and ‘kraut-making journeymen currently dwelling at the MOFGA Common Ground Education Center in Unity. These young agrarians are Farmers-in-Residence (FIR)—a unique, sought-after position through the MOFGA journeyman program, which offers aspiring farmers the opportunity to live and farm at MOFGA’s Common Ground Education Center. As FIRs, Holly and Brian are given two-year access to land, resources and support, plus additional benefits like access to a certified organic kitchen, enabling them to sell homemade tempeh, a fermented soybean value-added product. In a few months Holli and Brian will transition out of the FIR program to a new piece of land with a long-term lease in Washington, Maine. While they’re not ready for land ownership, Holli would like to be settled in one place for an extended period of time to help them determine where they will farm, long-term. As Holli and Brian’s time in Unity comes to a close, MOFGA will begin the cycle anew, reviewing and evaluating applications to determine the next Farmers in Residence. Check out the online application, due October 15th, 2011 for more information, and read the bios of the current journeymen. The sun set over the Education Center while attendees herded over to tables covered with farm-fresh goods: slices of artichoke frittata, fried green tomatoes and cubes of melon so ripe they tasted like wine. Young farmers swapped mason jar cups of kombucha and shared stories, concerns and aspirations. They marveled over the lightning-speed of summer, the beleaguering tomato blight, the looming cold months and their next move. If you live in the Maine area, come check out the next MOFGA event—you’ll learn something new, eat well and, above all, you’ll have the opportunity to meet our future farmers of Maine. Regina Fitzsimmons is a fall apprentice at Super Chilly Farm, an heirloom apple orchard in Palermo, Maine. She works for Gary Paul Nabhan, the Quivira Coalition, the RAFT Alliance and Sabores Sin Fronteras. Regina loves to garden and cook. You can read about her successes and flops at http://reginarae.com.